As we noted last year, the Supreme Court’s decision in Alice Corp v. CLS Bank is expected to have a significant impact on patent litigation. The case was expected to curb suits brought forth by NPEs — non-practicing entities — also endearingly referred to as patent trolls. The judgment, however, may have been quixotic as suits filed by NPEs actually increased in 2015. 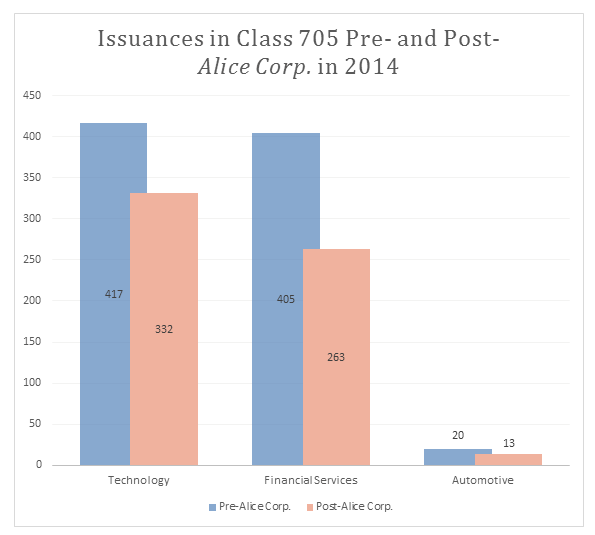 According to Patent Vue’s calculation, the number of Issuances increased following the Alice Corp decision, especially in the Tech and Automotive sector. 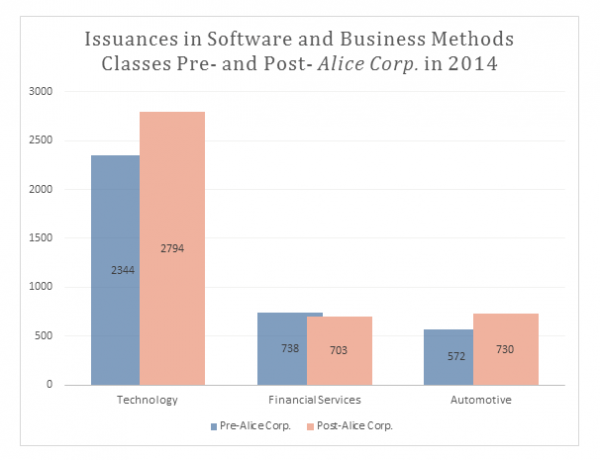 So what did Alice Corp affect? It dramatically decreased the number of filings in Class 705, which the USTPO designates as “business methods.” The ruling also shifted patent litigation to the South. 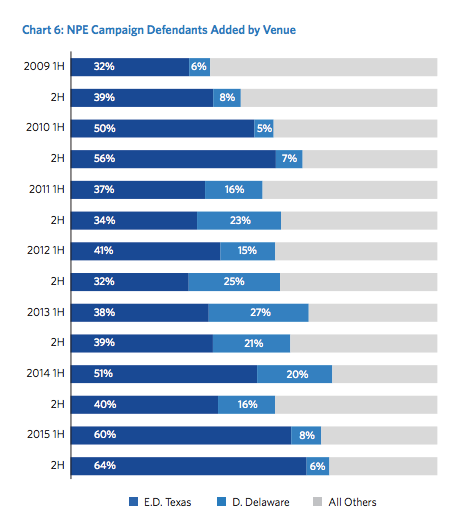 According to RPX Corp’s report, the parity in NPE venue selection has decreased significantly. In 2009, the Eastern District of Texas hosted 32% of NPE filings. In the second half of 2015, that number doubled to 64%. The Eastern District of Texas is known for being the most plaintiff-friendly litigation venue, making it the preferred locale for frivolous and meritorious lawsuits alike — but perhaps more of the former. Delaware trails in close second as another plaintiff-friendly venue. The question remains, how will this ruling, and its subsequent reactions, affect law firm demand? Of all the IP positions opened for associates in 2015, only 28% were for patent litigation positions. Interestingly, the most demand for IP associates came from D.C., which accounted for slightly over 15% of all demand. It was closely followed by Silicon Valley (15%) and New York (14%). California still remains one of the biggest players in the IP litigation market despite the shift of NPE filings towards the South. Though many expect the IP market to hold steady, we could actually see an increase in IP litigation activity. According to a study by the University of Illinois Law School, IP litigation increases inversely with declines in the GDP and NASDAQ index. With the current market in turmoil, we could in fact see a rise in IP litigation openings in 2016. Partners I’ve spoken with recently have echoed this sentiment. Although numerous IP boutiques suffered significant losses in 2015, many of their Biglaw counterparts have emerged with strong growth plans for 2016. In just the last month, I’ve spoken with three IP practice leaders looking to expand their associate ranks with multiple hires in the Bay Area. Notably, each of these platforms have robust IPR practices, and none of them had overextended involvement in the smart phone wars. That appears to have been the recipe for success. High-tech expertise continues to be the primary recruiting focus for most of these groups, but demand for talent in life sciences is seeing a strong resurgence as well. While most other practices may start to lag in the wake of the market downturn, IP litigators might consider using this time to explore their options. Firms are eager for IP associates and partners, especially in the Bay Area, and attorneys can leverage this market knowledge to secure greater compensation packages or positions at upper-tier firms.